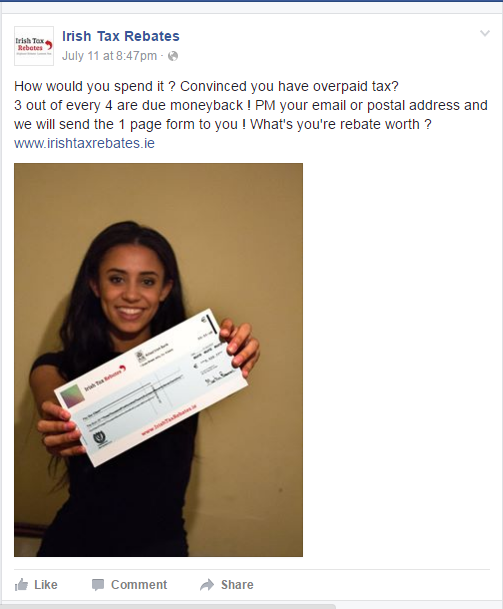 I’ve only recently become aware of the Irish Tax Rebates service and know practically nothing about them, but they seem to be a highly reputable and professional company. Still, I’m rather disturbed by their Facebook advert which shows a young lady holding a company cheque she received from them for her tax refund. You should never, EVER, allow the Revenue Commissioners to pay your tax refund to a middleman. This is a basic protection against tax payment fraud and applies regardless of whether the middleman is a tax refund agency, another service provider, or even your trusted accountant. It’s far safer to have the taxman pay you, and for you to pay your accountant or agent fees separately. Also, if you owe a tax bill to Revenue, you should always make your payment directly to Revenue. You should never, ever make a tax payment to an accountant, lawyer or other middleman. It’s fine to give them a (preferably crossed) cheque made payable to the Revenue Commissioners or Collector General, but not one made out in their name. Because if you do, and if they fail to pay it over to Revenue, all hell will break loose, and you could end up seriously out of pocket. In the past, so many people have been badly ripped off by ignoring this basic rule. Don’t risk becoming another victim of tax payment fraud.